Problem: A car dealer moving into a new facility with a limited time lease. 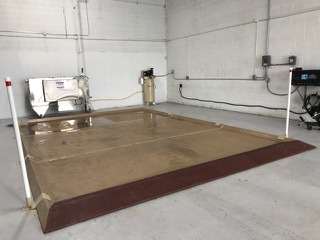 The property owner did not want them to cut concrete or substantially alter the property but the dealer needed to be able to wash dozens of cars per week onsite, contain the water and discharge it properly to the sewer. Solution: For a complete wash system, we recommended installing a SPT-10 Clarifier Oil Water Separator System, a cold water pressure washer with a portable hose reel, and a portable wash containment pad. This allows them to wash as many cars as possible without any major modifications to the property. They will also be able to move the entire system to a new facility at the end of their lease. With their input, we helped them layout the system to maximize their space. After installation of the pad, however, they noticed the concrete floor slope much slighter than originally thought and that the wash water was not moving off the pad well. This flat slope left his staff working in standing water and the SPT-10 not being able to process the wash water properly. To improve this drainage issue, our staff developed a low cost under layer for the wash pad which created a slight slope for the water. We then installed this under layer and re-piped the in-take piping for the SPT-10 so the wash water flows freely. The general manager of the facility is very pleased with our systems and service.